Make sure you select Fuyu persimmons for this salad—they are sweet when firm, unlike their cousins, the Hachiyas, which are ripe when their flesh is as soft as jelly. If you are unable to find persimmon, substitute pear or apple. Peeling a pomegranate can seem daunting, but it’s actually pretty simple. Rule number one: make sure you’re wearing dark colors—the juice stains. I like to score the fruit through the skin with a sharp knife (below the skin, but not deeply into the fruit), so you’ve divided the sphere into quarters. I gently separate the scored fruit into halves, and then quarters. Then turn the skin inside-out, gently so the seeds come out. Separate the pale membranes from the seeds, and rinse the seeds. Some like to do this in a bowl of cold water, so the fruit is fully submerged. The membranes that attach the seeds to the skin naturally float to the surface as you work them apart from the seeds, while the seeds sink to the bottom of the bowl. It’s an ingenious idea, but home cooks have been peeling pomegranates in their own personal ways for centuries—so do what feels right. Pepita is the Spanish term for hulled pumpkin seeds. You’ll find the flat, green seeds packaged at Trader Joe’s. When toasted they make a nutritious snack, so reserve any leftovers. Place olive oil, vinegar, a pinch each of salt and pepper plus the fruit juice into a empty and clean jelly jar. Screw the lid on tightly, and shake to combine ingredients. Toast the pepitas by placing in a small skillet over medium heat. Shake the pan frequently to turn and move the seeds around, to prevent them from burning. Toast the pepitas until they are covered with golden brown spots. Remove from heat and cool slightly. Toss torn greens with dressing, just enough to coat. Refrigerate any leftover dressing for later use. 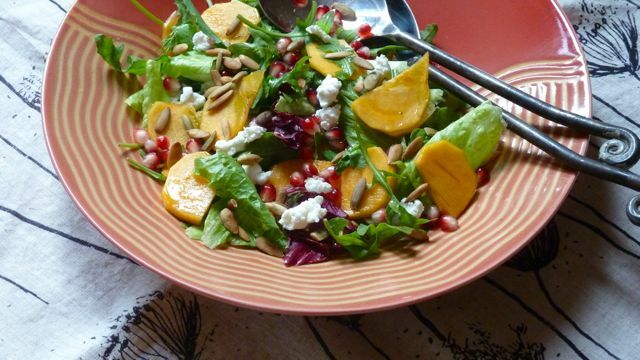 Evenly distribute persimmon, pepitas and pomegranate seeds across the greens. Separate cheese into small pieces and place on top. This entry was posted in Recipes and tagged lettuce, persimmon, pomegranate, salad by Four Cooking Together. Bookmark the permalink.